Numerous recent studies have shown that switching to a standing desk can give a range of health benefits, including reduced risk of cardiovascular disease, obesity, diabetes and even cancer. Especially in the UK, more and more workers are spending long periods of the working day at their desk – over 5 1/2 hours in fact for the average office worker. Not only is the ‘stay-late culture’ playing a part, but deadline pressures mean that many people even east lunch at their desks, meaning that the once-sacred hour of leg stretching no longer exists for many. While it’s easy to imagine that burning a few extra calories will help you stave off weight gain, what is interesting about some of the new research is the idea that the health benefits of standing or rather the negative side effects of sitting, extend way beyond calories consumption. In fact, studies have shown that even if you burn many extra calories through strenuous exercise, such as at the gym, when you are not sitting, this does not counteract the negative health effects of hours of prolonged sitting. Evidence cited in places such as this Stand Up While You Read This Article in the New York Times point to a so called “physiology of inactivity” which leads to your body going through processes due to prolonged sitting, which can seriously damage your health. Lipoprotein lipase is a molecule produced during the flexing of large muscles, such as your legs, and it law levels of it are linked to heart disease and other serious health problems. Just standing up or walking slowly is enough to activate its release. There are many other biological factors that lead to exercise metabolising sugar and fat. Poor metabolism of these has long been linked to the development of diabetes, cardiovascular diseases and even cancer. Taking the often quoted “10,000 steps a day” while seeming an arbitrary figure, has been shown to have hugely beneficial metabolic effects when compared to taking taking under 2,000 steps – like many people who drive to work, take the lift and sit to work all day. Using a standing desk for work can burn around an extra 50 calories per hour and activates the large leg muscles to release Lipoprotein lipase. 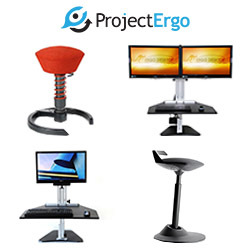 Using a portable, desktop solution like the popular Kangaroo adjustable height desks from Ergo Desktop – supplied in the UK by Project Ergo Ltd – can make this easy to achieve, and means that you have a flexible solution that can be used with existing furniture. When standing at work, your body also naturally moves a little more than when sitting, as people tend to shift a little from foot to foot. It also seems like less of an ‘ordeal’ to walk around a bit, as you are already standing up. If you are looking to lose weight, find a more ergonomic work set-up or improve your overall health, you may find that standing desks offer a wide range of benefits. They can help you to improve your feeling of alertness and focus, and reduce neck and back pain, as well as longer term health issues.